Today I want to talk about one of the places that is near and dear to my heart. It’s pretty safe to say that eating healthy food is one of the most important components of my life, but let’s face it, sometimes it can seem difficult to eat clean on a budget. Add in the fact that we’re inundated with commercials and advertising (both conscious subconscious) on a daily basis, and it’s no wonder that people are so flustered by what to eat and how to do what’s best without spending a fortune. My parents were Costco members when I was a kid, so it felt natural when I got my first Costco membership a couple of years ago. While all of those thing I marveled at as a child still exist on the shelves today (think enormous cookies, chocolate muffins, slab cakes, and vats of sour keys), they’re certainly not filling my shopping cart. Rather, I’ve come up with a much more effective means of shopping at Costco that not only allows me to eat clean, but also helps me save money while I’m at it. If you’re a Costco (or other wholesale club) shopper, leave a comment telling me what your favourite healthy Costco products are. Have I missed some absolute gems in my list? I want to hear about them! This is awesome! Explains why my local super market has changed their layout to the most annoying way possible. Love the diagram. Thanks Tamara! Gah I know what you mean about supermarket layouts. A little while ago, the Sobeys I go to totally switched things up. It drove me crazy! wow!! LOVE the graphics today, angela – and the info! thanks for sharing!! as we have discussed, i am hoping to get to costco some time soon – to get some deals AND to browse. my parents had a membership when i was a teen, but i have not been for at least 20 years. too funny that the hotdog is still the same price! please feel free to share your findings/deals any time – very interesting! Thanks Cathy, and I’m glad you found it useful! If you do become a member, I think you’ll probably go nuts in the cereal aisle! They have tons, and a couple of Nature’s Path cereals like the Ancient Grains granola which I love. I’m always happy to take you with me for a little field trip, so let me know if you fancy that! Oh I really love those chicken breast packs too, Desiree! As a (poor) student, I used to buy regular chicken breasts at the supermarkets nearby, but once I tasted the Costco chicken, those other ones don’t even compare! The Costco I go to is about 15 mins away, but I think we need another one in the area because it’s usually totally rammed with people. I’ve started to make Thursdays my Costco days because it tends to be quieter. I hope you have a great day too! angela, i heard that they are going to be putting in a costco on ira needles blvd, in the boardwalk development – hope that is true!! Oh my goodness, that would make my YEAR!!! I am keeping my fingers crossed very tight. Thanks for the insider info Cathy! Oh thanks for the info on the black rice Janet! I haven’t tried that yet but I’ve noticed it on the shelf. Might have to pick it up next time! Sam’s Club has a huge thing of fresh organic baby spinach for like $4 – such a great deal!! I’ve never been to Cosco.. I want to see what itz like! Hehe I’ve never been to a Sam’s Club, but I imagine they’re probably very similar! Love, love, love Costco. I head for the produce. Organic romaine, berries, spinach and carrots. I buy raw nuts there as well. I have a gigantic container of mushrooms in the frig right now. I will be looking through your recipes to find something to make with all of them. I always look through the clothes as well. I have found a few cute tops and jackets. Thank you for the post. I have to be careful around the clothes – there’s always something I ‘need’ in those piles! We get our juicing carrots at Costco. They are organic and at least half the cost as in the little mountain town we call home. It’s also a great place for nuts. These graphics are great and so true. If we have time to wander around we end up with a HUGE bill! Aren’t those carrots the best!? I love how sweet they are, and they look much cleaner than the carrots I’ve found at other grocery stores! The cashiers always ask why I buy so many, so I always have to give the juicer explanation! Look at you! That flow chart! The video! My goodness, Angela- this is some seriously good content! I love Costco but oftentimes have difficulty convincing myself I can eat all of the stuff that I buy from there. Usually my best-bets are things that can be frozen like the fresh spinach or cartons of greek yogurt. Usually too much fruit comes in a case for me to eat up before it goes bad (I like variety!). Thanks girl! I usually end up freezing a tub or two of Greek yogurt as well, but it never has the same consistency once it thaws! Thank goodness smoothie season is near – frozen or not, it always tastes good in smoothies! Awesome info graphic! My finance is a graphic designer, so I know how much time and work those things take! Great job! My fav Costco find is the frozen Edamame. They come in individual servings so they make a great quick and easy snack! Thanks Christine! Yep, they definitely take a lot longer than I expected to make but once I was a couple of hours in, there was no turning back! Great point about the edamame – that’s one I haven’t bought in a while because I’ve been buying the shelled kind from Sobeys instead, but I might pick up a box next time! Excellent post Angela! We trek out to Costco (45 mins away) at least once a month and it appears our cart resembles yours! I LOVE the spice aisle! Costco has mighty tasty looking treats which for better or worse are not GF so I skip those. I “treat” myself to a new spice when we visit, though I have run out of room…. The best deal of all are Manitoba Harvest Hemp Hearts! I also buy raw nuts (almonds, walnuts, hazelnuts and pecans), Nature’s Path granola, wild salmon and haddock fillets, baking soda (for cleaning!) and frozen berries for smoothies! Fantastic list Raeanne! I’ve seen the hemp hearts before but haven’t purchased them because I’m pretty sure one of those bags would last me a lifetime and I don’t want them to go rancid. However, if you go through them as fast as I go through some of the other products, I’m sure there’s no danger of that happening! Have you tried the mahi mahi fillets yet? They’re great in Asian-inspired marinades! Angela! I can’t wait to share this with people! I love Costco for a lot of my pantry items like organic coconut oil, organic coconut sugar, raw almonds, raw walnuts & raw pecans, hemp hearts, raisins, olive oil, goat cheese, organic corn chips and you have to try their balsamic vinegar – SO GOOD! This winter we decided to buy their organic frozen corn, peas and green beans and it was totally worth it! It was like having fresh veggies – they didn’t even taste frozen! We recently found truroots brand of GF pasta there that is made with quinoa, brown rice and amaranth so the protein content is higher and it taste REALLY good! It is totally worth the membership but like you said – you have to stay away from the add-ons. I also try to stay away from the samples – which often are not clean eats and tempt you to buy more food to raise your bill! What a great post!! We go to Costco every few months… Will keep this in mind. This post is amazeballs! Love the infographic! I’m a costco member as well and these are great tips. Yay an Aussie Costco shopper! Sounds like the Costco love is worldwide! First time visitor to your blog – love the graphics & the video. I was happily surprised that I could still shop at Costco after I radically changed my diet in December due to health reasons. I thought for sure I’d have to only be shopping at places like Trader Joe’s or Whole Foods (neither of which is local for me, but Costco is). I am there once a week for great finds like huge pineapples ($3 ea), kiwis, 10lb bags of carrots ($5 ea), frozen cod fish, organic ground beef, fresh berries, loads of frozen berries, almond butter, the list goes on! I store the bag of hemp hearts in the freezer since I tend to use them a tablespoon at a time. I keep all nuts/seeds in the freezer. I do a lot of Costco shopping since we go through a ton of produce. The frozen kale is awesome for smoothies. Power super 7 salad! It’s delicious!! Ooh what’s this?! I’ve never seen it.. is it a veggie blend, or grains? Awesome video, infographics, etc! Very, very useful! I have two teenage boys, so I am at Costco doing a big shop every week. I tend to go around 7pm in the evening because I can’t stand the crowds either, and I have found that it is less busy at night….. even during the Christmas season! We buy a lot of fresh fruits and veggies – my boys eat tomatoes like apples and we go through a box in about 4 days. Yikes! I recently have stocked up on the hemp hearts, ground flax seed, sprouted brown rice, quinoa, coconut oil, raw almonds, natural peanut butter and gluten-free pasta. We buy lots of different frozen fruit to throw in smoothies – I didn’t know about the frozen kale, so I am very excited to get some of that for our smoothies as well! Thanks for the tip! My fav things to buy from cosco are the cinnamon (like you! ), sea salt, frozen fruits (never spoil! ), and salad mixes oh and nuts! A few other essentials I generally buy include raw almonds, walnuts and pecans. Canned tuna, sprouted brown rice, Wild salmon, and dried apricots. I recently found a bag of organic coconut sugar for baking. The nuts are definitely a big favourite, that’s for sure! I totally forgot about the dried apricots – those things are to die for! One of my friends in university would always have a big stash of the dried apricots, mangoes, and cranberries at her place, so those were often our movie watching snacks! Excellent vid–I may just skip on over to Costco! Tell me, are the veggies you picked up organic? And do they have a good selection of organic fruit? I’m just curious. Thanks! didn’t have a chance to scroll through all the comments so not sure if anyone mentioned the hemp hearts already! I just bought a small bag at superstore to test them out first, and 227g cost me $8.49. At costco I think i saw a huge bag (google search yielded the info that it’s 798g) for about $16 which is a great steal! A great vegan protein and omega source, I am already hooked and it’s on my list for next time! Also scored a massive jar of organic coconut oil for under $18 which is also my body moisturizer as well (i whip it with a hand mixer to make it easier to slather on). Loved this post as I recently got my own membership as well! Nice posts I really like this.. This is so interesting! We are members of Costco and go about once every other week. I am usually good at sticking to my list but there are so many ways to get tempted. 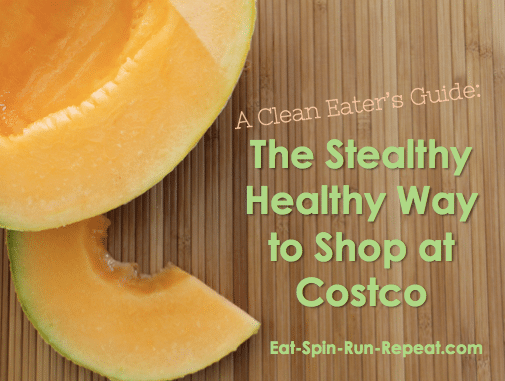 Thanks for these tips…My Costco shopping just got way healthier! I’m glad I could help Shannah! I hope you enjoy exploring some new-to-you healthy finds! I love this, the video is great help! I have be debating about getting a membership to B.J’s ( it’s like Costco) but didn’t know if it would be worth it for healthy food. I will be getting my membership on Monday now for my weekly grocery trip! Thank you so much, I love the graphic too! I LOVE Costco! We buy a good portion of our fruits & veggies there. I also like their organic meat selection. My favorite find has been the 2 lb. container of organic Butternut Squash (cubed) for $3.99. Whenever they have them, I stock up and keep in the freezer. Great for soups, sauces, etc. Thanks so much for this post! Nice to get so many other ideas for healthy finds at Costco. I love COSTCO! I alternate shopping between COSTCO, ALDI and Trader Joe’s. I love to buy a big bag of broccoli for roasting. We need to make a big trip soon. It’s almost time for the “toilet paper, fish, fruit, paper towels” trip which is always a huge hit to the budget. You’re so lucky you’ve got a TJ’s – I am keeping my fingers crossed that one day we’ll get one here in Ontario! And I totally agree with you – when it’s time to do the ‘toilet paper and paper towels’ Costco trip, that definitely hits the budget hard. I’m not sure if you know this though, but Kirkland toilet paper is Costco’s #1 top seller! Apparently it undergoes crazy amounts of durability testing. Reading about it has given me a whole new sense of appreciation for the stuff! 😉 LOL! Random late comment, but I love Costco. Some things that find their way in my cart: organic laundry soap, Organic Almond Butter, Organic frozen broccoli, organic bagged spinach and spring mix, frozen berries, frozen chicken breasts, flax seed, quinoa, agave, and of course their spices. I absolutely love their vanilla extract! So much cheaper! This is such a great list Amanda! You can’t beat the price of a lot of their veggies, and I love their vanilla extract too. You get at least 10x the amount that you’d buy in a regular grocery store for the same price! I hear there’s also a whole grain, gluten free pancake mix that has hit shelves recently and it wasn’t at my location a couple of weeks ago, but I’m definitely checking this weekend! My favs for juicing and smoothies are the organic cherries, organic blueberries, and organic mango chunks. I just found All Natural & Organic Quinoa & Kale in steamable bags frozen section from Path of Life. So yummy!!! Individual bags of about 2 cups each. Sweet Kale Salad!!! Soooo good! in the fresh section, chopped kale, brussel sprouts, cabbage.